NEW DELHI: BrahMos Aerospace has been conferred with the IEI Industry Excellence Award 2015 for its remarkable role and contribution in the field of Manufacturing and Processing in India. 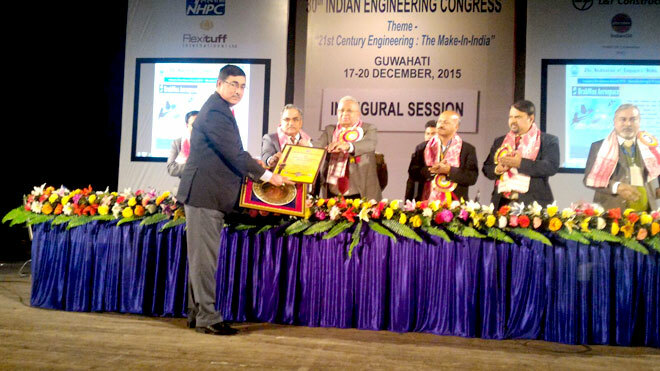 Shri Tathagata Roy, Hon'ble Governor of Tripura, presented the prestigious award to BrahMos, during the 30th Indian Engineering Congress, organised by The Institution of Engineers (India) (IEI) at Guwahati on 18 December 2015. Lt Col (Retd) Anil Misra, GM (Infra & TP) accepted the award on behalf of BrahMos Aerospace. BrahMos Aerospace, the India-Russia Joint Venture, is the producers of world's leading supersonic cruise missile system BRAHMOS. BrahMos JV, a role-model for other defence cooperation, has redefined the business of selling military products from a purely buyer-seller relationship to joint research, design, development, production and marketing of state of the art military systems. The 30th Indian Engineering Congress of The Institution of Engineers (India) on the theme "21st Century Engineering - The Make in India Pathway" was hosted by the Assam State Centre.